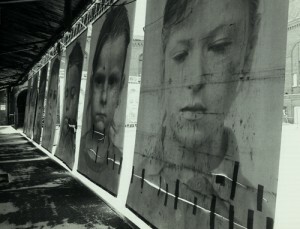 Large, billboard-sized faces of children may tower over the city later this year if the City Council approves a Holocaust memorial art exhibit by artist Gottfried Helnwein. Helnwein's exhibit, "Ninth November Night - Selektion," depicts billboard-sized photographs of children treated with whitewash to appear to be images of Holocaust victims. The children are not actual Holocaust victims, but children of the present day. "There is an important component of education to go along with this exhibit,"Human Relations Director Mary O'Gorman said. "This is a Holocaust Memorial, and the intent at times is to overwhelm." The exhibit is described as "an art event to focus the conscience of the viewer and, through media exposure, the conscience of the widest possible public" by the artist's draft proposal. "An art installation a city block long...will rise into public view to cry out against not only one of history?s most tragic and horrific episodes of prejudice, but also against the current resurgence of the endangerment of children through intolerance around the world." The exhibit was first presented almost ten years ago in Europe at Cologne's Museum Ludwig. The exhibit was met with bewilderment and aggressiveness by some of the population, with one being slashed and another stolen. The slashed photo was patched up and used in subsequent exhibits as a reminder of the persecution of Jewish people. The Human Relations Commis- sion voted to support the exhibit and work with the Fine Arts Commission to develop a more detailed recommendation to the City Council. If approved, the exhibit would be displayed on city property. An initial site considered for the exhibit is Rexford Drive in front of the Beverly Hills Public Library. While Councilmember Tom Levyn indicated his support for the exhibit, he asked staff to research alternative venues.